Both Communist and non-Communist Governments are in complete agreement on a policy of ‘Full Employment’ as the only means through which the individual is entitled to life. 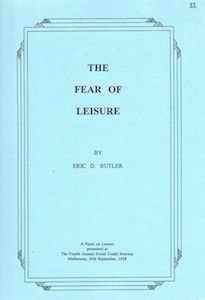 How can ‘fear’ of leisure be overcome? The brief answer is the application of the Christian teaching concerning love. The Christian teaching is that “Perfect love casteth out fear” The Social credit policy of growing leisure and financial dividents for all is based upon this type of love.